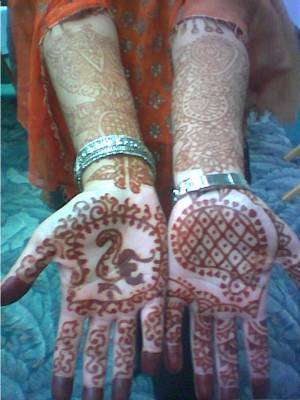 Creation Of Tattoo: Bridal Henna Tattoo for the palms of the hands. Bridal Henna Tattoo for the palms of the hands. Sometimes a picture just speaks for itself. Here are the palms of a happy bride just 24 hours after the past was removed. The color was even darker on her wedding day. Artwork by Ann George of Spirit Vision Henna Tattoo, Jacksonville, Florida. Bridal henna by appointment. Please call 904-993-7466 for more information.